So now I have officially driven a stick shift Jaguar F-Type. What’s more important is the stick shift Jaguar F-Type I drove was not provided by Jaguar, which means I can say whatever I want about it without fear of getting an angry e-mail from a PR person. (Editor’s note: That may still happen.) I could say that it reminds me of the Oscar Meyer Weinermobile, only uglier, and I would just giggle and giggle without consequence. Dave may have trouble scheduling future oil changes. But I’m not going to do that, because the stick shift Jaguar F-Type was great. 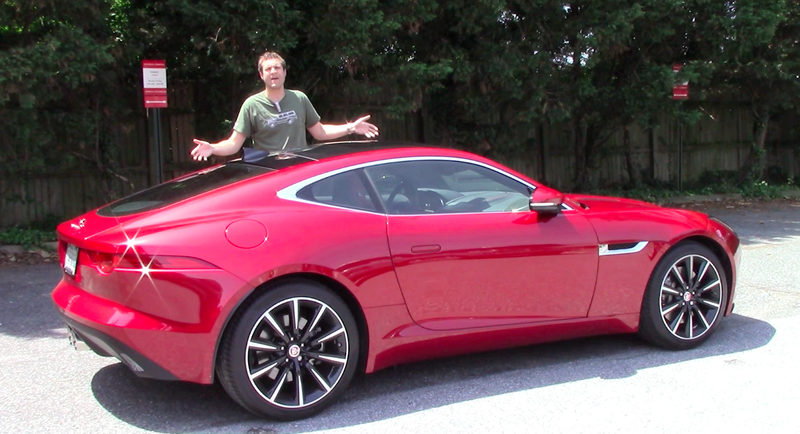 The primary reason the stick shift F-Type is great is the engine. But before I get into that, let’s discuss the F-Type’s engine lineup. It makes absolutely no sense. I say this because the F-Type offers three engine choices: a 340 horsepower V6, a 380 HP V6, and a 550HP V8. And 575 HP now in the new F-Type SVR. In other words: you can get the base model, a slight power bump over the base model, or a huge horsepower boost from there. You’d think there would be some sort of middle ground, but then, what do I know? Jaguar clearly has the car industry figured out, seeing as they recently celebrated a successful decline in average buyer age from 82 to 81-and-a-half. So anyway, the engine. If you want a stick shift, you have no choice: you have to get the V6. So Dave got his F-Type with three pedals and a 340 HP supercharged V6, which sounds quite nice. So nice, in fact, that it makes many modern V8s sound like the motor in a window-mounted air conditioner. Now, I know what you’re thinking: ONLY 340 horsepower? That’s IT? I say this because every time I post anything about my Aston Martin, which has 385 HP, some of you people freak out and tell me my car is “slow” and I should get a Corvette Z06 and modify it so that it makes 1,000 HP, because everyone knows that more power is better, even though I live in a city where I am often passed by horse-drawn carriages as I drive down the street. Me, I’m not as much of a horsepower fan as I was when I was 13 and the only car I knew was my dad’s 135-HP Toyota Camry. This largely stems from the time I had a 556-HP Cadillac CTS-V Wagon, and I realized that amount of power is stupid, and unusable, and ever since then I’ve focused on balance instead of power. And do you want to know something? The F-Type is a master of balance. Here’s what I mean: you can wring the thing out in first gear. You can wring the thing out in second gear. You can rev-match downshifts, you can quickly drop two gears to pass someone, and you can cruise around in third just waiting to pounce. And you can do all of this within the confines of a normal speed limit. Attention, people who love ridiculous horsepower: it is possible to have fun without simply pushing down the accelerator and watching your speed climb like you’re racing Dominic Toretto. And that isn’t even the best part. The best part is in the corners, where the F-Type reminds you that Jaguar—noted manufacturer of luxury cars for people who fondly remember the Eisenhower administration—actually knows how to build a sports car. The suspension is surprisingly good, the car is stunningly tossable, and there’s a tremendous amount of grip. I also love the steering feel, which isn’t over-assisted, or vague, or uncertain, like it is in virtually every single modern automobile manufactured today. And then there’s that engine note. My God, that engine note. All stick shift F-Types come with a little button on the center console that transforms the engine note from “subtle” to “no, officer, this exhaust isn’t aftermarket, it came with the car.” (After you’re in handcuffs, of course.) Driving around hard, with the button pushed, you’ll have moments where you think you’re in an exotic car. So I really like the stick-shift F-Type, and I think that’s mostly because it takes a little skill to enjoy it. Not a lot of skill, like back in the day when Ferraris had clutches that were so heavy that you considered employing a small child to sit down there and push it whenever you were stuck in traffic. But more skill than, say, the 550 HP version of the F-Type, where you simply mash the throttle and brag to everyone how fast “you” are. If you want your own F-Type, they start at $66,000, though the one I drove was seventy-eight and some change. This is a large amount of money. However, I am authorized to share an important secret with you: Jaguars lose value very quickly. Very quickly. So quickly that eight years from now, you’ll think to yourself: Should I get an F-Type Coupe? Or a framed poster that says “Live Laugh Love”? In this case, I strongly recommend the Jaguar. With a CarMax warranty.